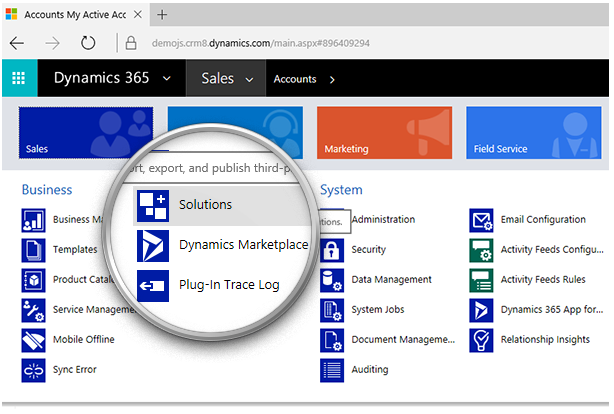 Microsoft Dynamics 365, a popular enterprise business solution designed to manage business processes, has a plethora of features that fulfill most business needs. But because every business is different, each enterprise generally requires customization. Fortunately, the customizations are straightforward, and can be done through plugins, actions, and web resources. If you'd like to watch a video for this process, skip to the bottom. Display entity records in FlexGrid and perform Excel-like filtering, sorting, and grouping and display hierarchical data. Users should be able to update records on FlexGrid, which should update the entity record in the CRM. Since our HTML page is going to need a FlexGrid and FlexChart to display the data. We are going to add them First and then move to add the JS code later. We have also added FlexGrid filter directive and Group Panel to provide Filtering and Grouping features. <a style="margin-top:10px" class="btn btn-success btn-lg btn-block"
We're using Dynamic CRM’s Web API to read and write data on Accounts Entity. Data fetched from Web API will be displayed in the FlexGrid, and any edits in the FlexGrid will be updated back to Dynamics 365. We're also creating a function to analyze data and show the resulting data in a FlexChart. This is all the code we need to create our Account Dashboard with Wijmo 5 controls! Note: we need to provide relative URLs for our dependencies in the HTML page, as they also need to be uploaded as Web Resources. Uploading the dependencies is a one-time process, and once done, we can re-use the dependencies in other Web Resources as well. Now we'll look into the second half of the process: deploying the code to Dynamics 365. Once we publish the files to the CRM, our Account Dashboard will be nearly complete. 3.3 Upload the Files as Web Resources. If you would like to know how to upload Web Resources, then please visit here. Navigate to Accounts Home Page and click on the Analyze Accounts button. It should open the Account Dashboard as a Modal Dialog. Lastly, we'll look at the interactivity that makes FlexGrid such a powerful grid tool. Grouping: Drag any column to the section that reads “Drag columns here to create groups” and your groups will be created. We can create multiple groups as well. Filtering: Each column has a filter icon built-in. Click the icon and we can filter based on value or conditions. Sorting: Clicking on any of the columns sorts the data based on that column. Data Operations: Try editing any of the cells. 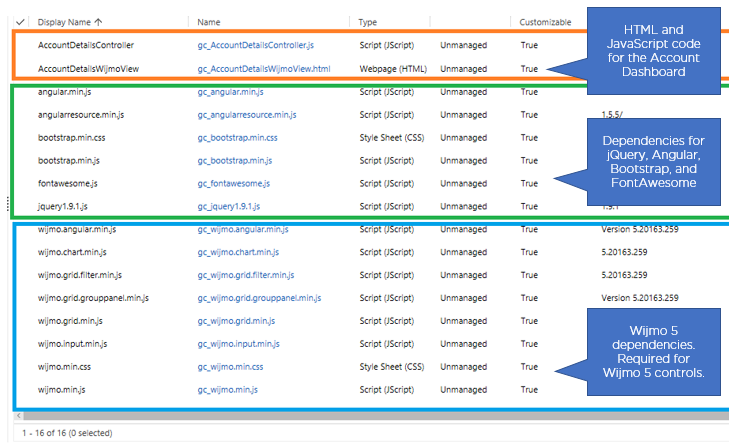 Once the edit is complete, click on update to update records in the CRM. The data refreshes, updating FlexGrid and pie chart automatically. That’s all, folks! If you need more information about Wijmo 5 controls, check out our Sample Explorer and Docs. You can also download a free trial of Wijmo 5. 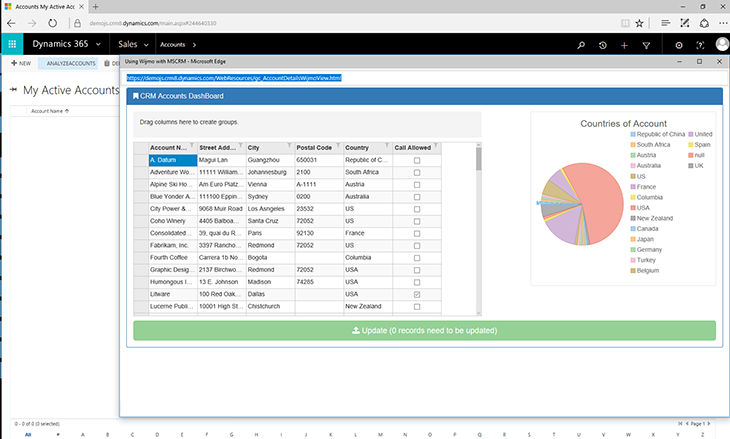 MSCRM Solution: We also created a MSCRM solution which can be directly imported into your CRM Instance and you can see the Dashboard in action at your end. 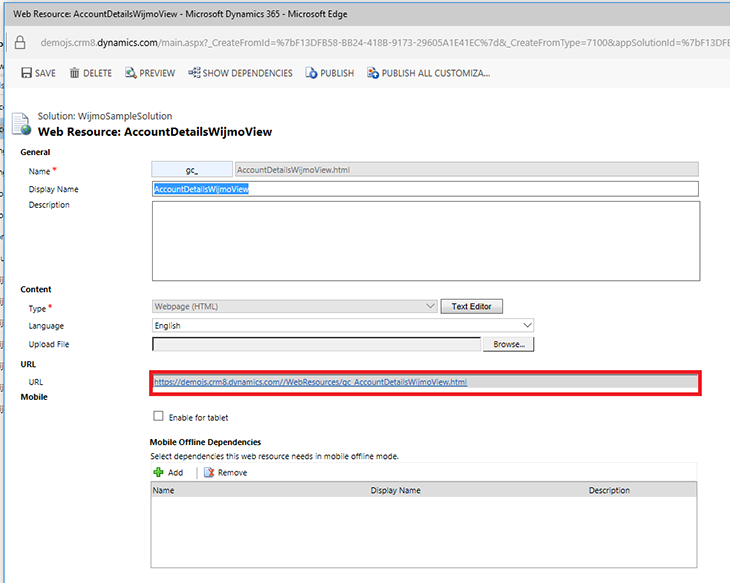 WijmoSampleSolution_With Ribbon Button: Can be imported to Dynamics 365 only and contains “Analyze Account” Ribbon Button, visible on the Accounts Home Page.